This is who President Obama and his quisling administration sidled up to and nuclearized. Enemy is the White House. Israel is calling up reserves, opening bomb shelters, and activating anti-missile systems. ISRAEL has reportedly put troops on high alert for an imminent attack after spotting “unusual movements” by Iranian forces in Syria. Israel’s military has put soldiers on “high alert for an attack” and told them to be ready for “all scenarios” after identifying “irregular activity of Iranian forces in Syria”.Local authorities in the Israeli-held Golan Heights have been ordered to “unlock and ready [bomb] shelters” in anticipation of an imminent attack. “The IDF is ready and prepared for a variety of scenarios and warns that any action against Israel will be answered with a fierce retaliation,” The Israel Defense Forces said in a statement. The warning about a potential strike came just moments before US President Donald Trump unveiled his decision to pull of the Iran nuclear deal. On Monday, Iran’s army chief of staff warned that the regime would respond to any Israeli aggression when the time is right. 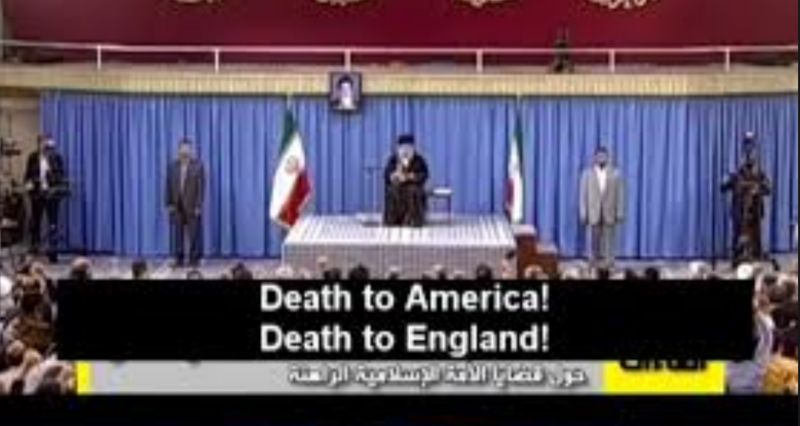 “If the enemy casts a covetous eye on our interests or conducts [even] a slight act of aggression, the Islamic Republic will give an appropriate response at an appropriate time,” General Mohammad Bagheri, state media Press TV reported. Iranian leaders threatened harsh reprisals against the United States following President Donald Trump’s decision to abandon the landmark nuclear deal and reimpose a series of harsh sanctions on Tehran that were lifted under the original agreement, according to U.S. officials and regional reports. Trump announced Tuesday afternoon that he will no longer abide by the deal, which he described as empowering Tehran’s nuclear and missile programs while providing little benefit for the world. “The United States will withdraw from the Iran nuclear deal,” Trump announced, before signing a presidential memorandum to reinstate U.S. nuclear sanctions on the Iranian regime. Trump described these actions as “the highest level of economic sanctions” and said they could target any global business that does not wind down its business and investments in the Islamic Republic. The White House said there will be a period of time in which those doing business in Iran can wind down operations. After this period, those doing business with Iran will risk severe consequences. The deal cannot be fixed, Trump said, after months of negotiations between U.S. officials and European allies. Trump said he is willing negotiate a new deal, a term that Iranian leaders have rejected outright. Iranian leaders quickly lashed out at Trump, threatening harsh reprisals against the United States and vowing to never renegotiate a new deal to constrain the country’s nuclear enrichment program, which Iran has bragged can be put online in just a matter of days in a much greater fashion than it was capable of when the deal was originally negotiated by the former Obama administration. The deal is “by no means negotiable,” Iranian President Hassan Rouhani said in recent remarks to European leaders. Rouhani emphasized that Tehran would not accept any new restrictions on its nuclear program and its ballistic missile development, which has emerged as a key concern in the region and beyond.